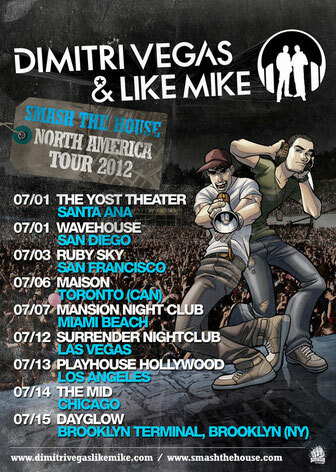 Brothers Dimitri Vegas & Like Mike recently announced their second major tour of the United States and Canada for 2012. 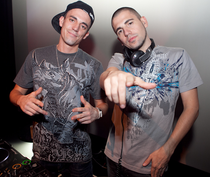 Hitting the cities of Santa Ana, San Diego, San Francisco, Toronto, Miami, Las Vegas, Los Angeles, Chicago and New York, the pair are buzzing from their arena-closing set at Electric Daisy Carnival in Vegas last weekend. Known for their huge mash-ups in the mix and Mike’s persona on the mic, these two Belgian superstars have swiftly created a niche position for themselves in a majorly crowded market, bringing a live MC element to their shows that hypes already bumping dance floors to electronic extremes. For tickets and latest info, click HERE. Simply wish to say your article is as astonishing. The clarity in your post is just nice and i can assume you're an expert on this subject. Well with your permission allow me to grab your feed to keep updated with forthcoming post. Thanks a million and please continue the enjoyable work. These are really impressive ideas in concerning blogging. You have touched some nice things here. Any way keep up wrinting.